Non-governmental organisations (NGOs) play a key role in biodiversity conservation. The majority of these organisations rely on public donations to fund their activities, and therefore fundraising success is a determinant of conservation outcomes. In spite of this integral relationship, the key principals for fundraising success in conservation are still guided by expert opinion and anecdotal evidence, with very few quantitative studies in the literature. 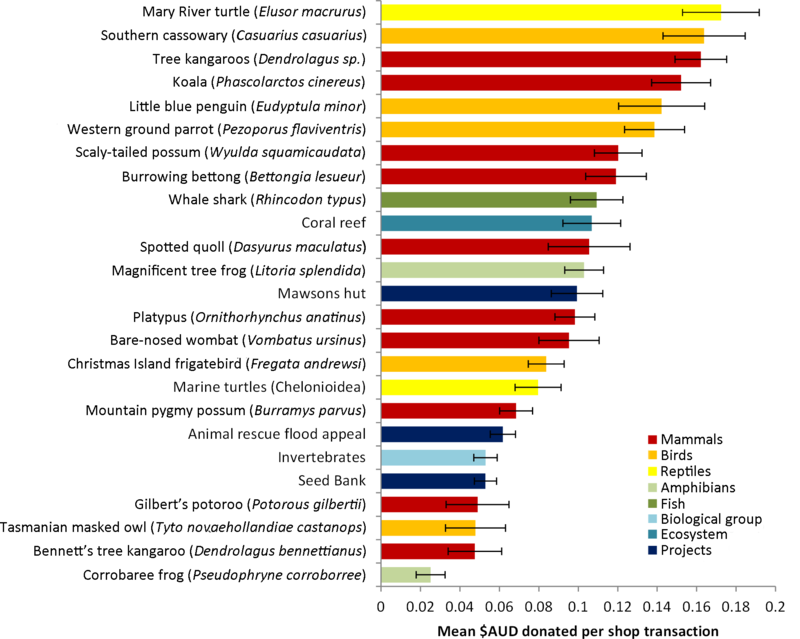 Here we assessed the behaviour of monetary donors across twenty-five different species-focused conservation campaigns organised by an NGO conservation and environmental society. The Australian Geographic Society (AGS) carried out fundraising campaigns over a five and half year period using an identical methodology in thirty-four of its country-wide network of outlet shops. AGS owns and operates these shops that sell toys and games related to science and nature. We tested how the following factors influenced monetary donations from members of the public:1) campaign duration, 2) appeal and familiarity of species, 3) species geographic distribution relative to the fundraising location, 4) level of income and education of potential donors, 5) age and gender profile of potential donors. Contrary to past research, we found most of these factors did not significantly influence the amount of donations made to each campaign by members of the public. Larger animals did elicit a significantly higher amount donated per transaction than smaller animals, as did shops located in poorer neighbourhoods. Our study findings contrast with past research that has focused largely on hypothetical donations data collected via surveys, and demonstrates the complexity and case-specific nature of relationships between donor characteristics and spending patterns. The study highlights the value of assessing real-world fundraising campaigns, and illustrates how collaboration between academia and NGOs could be used to better tailor fundraising campaigns to maximise donations from individual citizens. Read all about this study here!